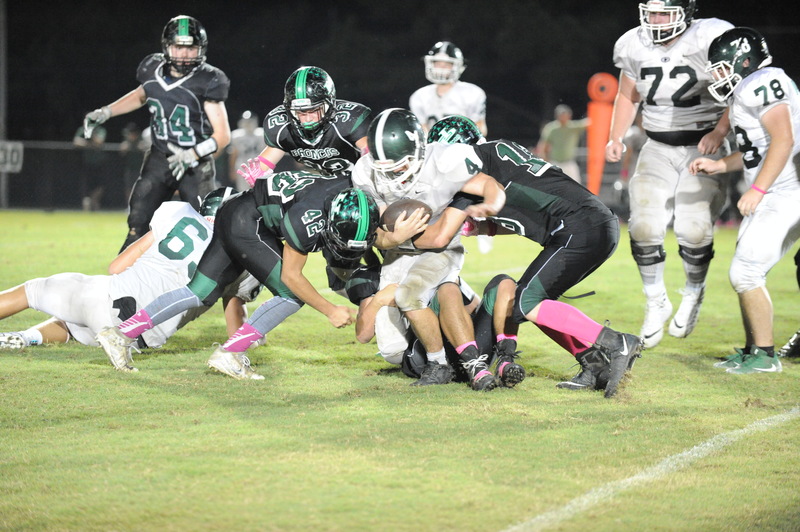 HOLLY POND – Holly Pond started off on an exciting note Friday night against the Locust Fork Hornets when the Broncos took the opening kickoff and carried it out to their own 40-yard line. The Broncos then proceeded to carry the ball, play after play, to the end zone for the first touchdown of the game by quarterback Kyler Chaney. Locust Fork then took the ball and immediately drove its way to the Hornets’ first touchdown and an early 7-6 lead. After that, the two teams seemed to be even for the rest of the quarter, until Chaney again managed to run through Locust Fork's defense. The Broncos almost scored, but only made it to the 5-yard line by the end of the first quarter. The second quarter started off just as thrilling as the first with Holly Pond scoring a touchdown and a 2-point conversion within seconds of the quarter's start. However, this quarter quickly slowed down. The Hornets could just barely hold their own and weren’t gaining enough ground to get into the end zone. Eventually, Locust Fork drove close enough to the end zone to nab a field goal. The quarter ended shortly after, leaving the halftime score at Holly Pond 14, Locust Fork 10. The third quarter started slower than the first two. Things didn't pick up until the Broncos’ defense recovered a fumble. Holly Pond quickly carried the ball to the end zone with Tyler Simmons finishing off the drive with a 30-yard score that stretched the Bronco lead to 28-10. After that, Holly Pond kicked the ball back to the Hornets, but they fumbled the ball and the Broncos were able to recover. The Broncos then drove their way into the end zone with a touchdown run from Jeremiah Holmes, this time with a 2-point conversion that made the lead 36-10. The game continued from there with fumbles and recoveries from both sides, yet no scoring plays. The fourth quarter was just a countdown to the end with no further scoring, allowing Holly Pond to pull away with the 36-10 win. The Broncos (5-2, 2-2) will take on 3A, Region 5 foe J.B. Pennington next week on the road.